Our students pride themselves on their ability to disrupt “business as usual” in the academy. They organize academic conferences and workshops and debate, collaborate on projects, and challenge one another. They also join, lead, or establish their own organizations and reading groups around common interests, many of which are open to students across disciplines. Learn more about New School for Social Research opportunities below, and make sure to check out the full list of New School student organizations. If you are interested in receiving funding for a conference or starting an organization, please contact P.J. Gorre, Coordinator of Academic Affairs. In the Three-Minute Thesis Challenge, participants must present their original research in just 180 seconds in an engaging form that can be understood by an audience with no background in the research area. Debuting at NSSR in the spring 2019 semester, the challenge is open to all MA students graduating in spring or summer 2019 and all PhD students. Participants gain presentation, research, and academic and professional communications skills and have the chance to win up to $1,000. Student-run conferences and workshops are organized each academic year and generally take place in the spring semester. Some receive support from the Dean's Conference Fund. The New School for Social Research Dean's Advisory Council consists of the NSSR Student Senate delegates, departmental student advisors, and other department representatives. The council meets with the dean on a regular basis throughout the academic year to discuss matters related to the quality of student life and the needs of the college in general. At the university level, a similar advisory body with representatives from each of the university's colleges meets regularly with the president of The New School. The members representing The New School for Social Research are chosen by NSSR Student Senate delegates. Elected student representatives are expected to attend meetings and report to their constituents on a regular basis. Student Associations are the representative bodies of each department. The Graduate Faculty Student Senate is the representative body of the college as a whole. The Sanctuary Working Group is a collective of students, staff, and faculty creating a campus that is inclusive, protective and just for all affected by racist, anti-immigrant practices. We work in coalition with La XENTE, the Latinx student org. We center undocumented, international, immigrant, and mixed-status family community members and all people of color in our meetings and in our efforts. We are student-led and have a student caucus which meets separately, in addition to larger meetings that include faculty and staff. We welcome new members. Extensive knowledge about immigrant justice is not necessary. We welcome opportunities to collaborate with other organizations, departments and programs across The New School. The NSSR Movie Club is a student-run initiative open to all students. Every semester focuses on a chosen director, with screenings and discussions held every other week. oikos NYC is the New York chapter of the international student organization "oikos," which seeks to strengthen sustainability-oriented entrepreneurship among tomorrow's leaders and decision makers by sensitizing students of economics and management to sustainable development issues. The New School Memory Group is an interdisciplinary network of scholars whose research addresses questions of remembering and forgetting. We bring together New School students, faculty, alumni, and friends. Visit our Facebook Group or tweet us @NewSchoolMemory. Theory Collective is a political theory workshop intended to provide valuable feedback and critique on both theoretical work and empirical or historical work informed by a theoretical framework. Meetings convene every other week around the work-in-progress of a presenter. Regular attendance is expected in order to ensure a thorough discussion of each paper. The Black Rose Reading Group meets weekly to discuss and engage a wide variety of modern and classical texts related to anarchism in its theoretical and practical manifestations. 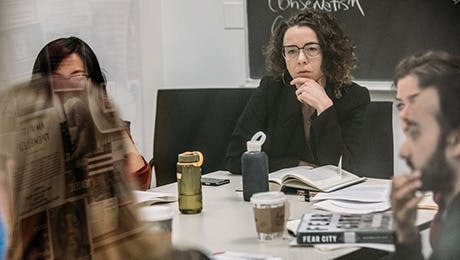 The Psychoanalytic Reading Group regularly gathers students with various levels of experience and interest in psychoanalysis and its connections with philosophical concerns to discuss readings that center around a chosen theme. The Wittgenstein Workshop is a research group that meets a few times a semester and invites scholars and NSSR faculty and students to present work-in-progress. While an interest in Wittgenstein might be helpful in attending, it is by no means necessary. People in Support of Women in Philosophy is a group dedicated to the advancement of women and those who experience marginalization within the field of philosophy. Our group meets weekly to workshop papers, help members prepare for conference presentations and seminars, host guest speakers, and in general celebrate the work of our women and gender-non-conforming colleagues and mentors. Men are welcome and encouraged to take part as allies. The Philosophy Pedagogy & Professionalization Workshops aim at preparing current graduate students to teach philosophy in an academic setting. NSSR faculty, alumni, and advanced NSSR PhD students with teaching experience facilitate these workshops, which are constructed around various pedagogical topics. In this way, these workshops supplement the department’s strong scholarship and provide students with practical pedagogical skills. The New York Phenomenology Research Group continues the long and storied tradition of phenomenological investigation at NSSR, introducing the next generation of students to the panoply of thinkers and topics for which phenomenology is known. No previous knowledge is required — all one needs is a willingness to return to the things themselves! Minorities and Philosophy (MaP) is an international organization encompassing a collection of chapters from different philosophy departments that examine and address issues of minority participation in academic philosophy. Through MaP’s network, students can exchange ideas on topics related to minorities and philosophy, meet and support peers, and learn from other philosophy departments. The New York German Idealism Group is a joint undertaking of the philosophy departments of Columbia University and The New School that organizes four events per semester, inviting scholars from the New York area and beyond to share their work on Kantian and post-Kantian philosophy in a workshop format.